Download and print Kimo Hussey’s version of “Hallelujah”. Download and print Kimo Hussey’s version of “Girl from Ipanema & Desafinado”. In the Ipanema tab all pinch movements are marked as a group of notes played at the same time with no up / down arrows (see the legend image). The tab software I use has no helpful markers for pinch movements, so remember : no arrow = pinch movement. Through the tab all up strokes are only done with the forefinger and marked with an up arrow (see the legend image). By default all down strokes are done with the thumb and are rather light brushes compared to the up strokes. When not played with the thumb these down strokes are done with the forefinger and I’ve written an ‘i’ (index) above the notes to help you (see the legend image). Kimo also often hit the 4th string (G) with his index. This movement achieves (at least) two things : first it helps you stay in rythm/tempo as every half time you’ll have a note to play. Secondly, the sound of the nail hitting the 4th string produces a soft sound that helps fill the bass line/ harmony in a nice way. In the tab I’ve marked these bass notes as ghost notes (note between brackets, see the legend image). I’ve not marked which finger to use for these notes as they are always played with the forefinger in a downward motion. For everything else I’ve put right hand information on which finger to use (i for index, t for thumb). It kind of repeats itself a lot but I hope it will help you. If you have suggestions on how to make this tab easier to read don’t hesitate to contact me. I wish I had a way to highlight the melody notes…but this is not something standard to music sheet and tab software. Knowing the tune’s melody and learning it’s rhythmic structure are invaluable assets you’ll have to focus on. Have fun ! I’m going to explain how to read the ‘Girl from Ipanema’ tab and get you started on Kimo Hussey’s right hand technique for the Low G ukulele. Please see this article as a start only as I’m not Kimo and probably missed a lot of the subtle moves he makes. in learning what he explains. Depending on your playing level & musical background you’ll have some homework to do. You’ll have to isolate most of your practice to the right hand only and get all moves as smooth as possible. Huge Mahalo to Kimo Hussey for his musical wisdom and inspiration and to Bertrand Le Nistour for freely sharing his time and skill in transcribing this music for us! Sigh. I am inspired just listening to Kimo’s voice. Then, to hear and watch him play so gracefully. Thank you. Mahalo John. And I agree regarding Kimo. Kimo, thank you so much for your dedication to ukulele, and for sharing your music with people around the world. The reason I play the ukulele now is that you introduced me to the instrument about three years ago when our paths crossed briefly on the Big Island. I continue to be inspired by your teaching and spirit. My ukuleles have opened up a new world of friends and music, and bring me joy every time I play. Thank you for the gift of ukulele, and marvelous music. This is amazing. So much God given talent. Wow. Just. Wow. This is great! I’ve seen his version of Hallelujah in several videos and have always wanted to learn it. I wish there was more information on the wood Kimo called “Meelo”? Where can we read up on it and which instruments are made of it? Milo – (Thespesia populnea) pronounced (me-low), a highly respected wood throughout Hawaiian history. Rich red and brown colors with a delicate lacey grain. To the ancient Hawaiians MILO and a wood called KOU (now replaced by KOA as the most common Hawaiian wood) were the most valuable and colorful woods used for furniture, canoes, paddles, and bowls. MILO has proved to be an excellent stringed instrument wood, producing deep resonant bass tones. Combines well with top woods such as Spruce, Cedar, and Sequoia Redwood. 39 lb/ft density and .55 specific gravity. Your new look is very classy but bolder type would make it easier to read. Kimo is my uke idol. I may never reach his level but I will have much fun trying. Sound samples are so important for uke buyers. How could you buy before listening! Thank you for those samples. So important. Kimo is a great salesman because he shows what the instrument is capable of. I have a sound in my head that I am searching for. When I hear it I buy it, if I can. Enjoy the new look and extended content of the resource center. The legend and explanation of Kimo’s pinch technique is very useful in learning Kimo’s style and I had a lot of fun learning his rendition of Girl from Ipanema using the explanation and music printout Kimo and you provided. Mahalo for all the cool stuff. Looking forward to seeing more videos from Kimo as well as Kalei, Corey, Aaron, Imua , and others. I’m so excited to see this on your site! Kimo is my favorite! Seeing Kimo Hussey’s rendition of Girl from Ipanema is what made me buy a uke in the first place. His style is so unique, and my goodness does it sound amazing. I also probably wouldn’t have bought my uke at all if I hadn’t seen all the helpful stuff you guys have on this website, this page included! Huge mahalo for having so many resources! Fabulous new site, Kimo’s playing is just mesmerising. Thanks for all you do for the ukulele world-wide community! I loved the Hallelujah video. The playing sounded beautiful and I enjoyed the thoughts about passion coming from this gentle soul. Great to see this site back and looking amazing! Love Kimo’s teaching style too – super humble and down to earth guy. Really enjoyed Kimo’s beautiful rendition of Hallelujah. On his request for suggestions on enriching the new website (which looks great btw), perhaps it is worth considering adding content by including a curated list of external links regarding certain topics (e.g., music theory for ukulele, online lessons, or ukulele player forums etc.) that you think are especially well done? Kimo’s style is very misleading in it’s simplicity. It’s much harder to only use the thumb and forefinger than it looks. The challenge is to be able to pick and strum across the fretboard with the finger and the thumb in an opposing direction and still pick and strum all of the strings needed to get a full blend of the strings and have the melody come through. The tendency at first is to strum the first top two strings and then knock into the forefinger as it picks the melody. It wasn’t until I watched very closely how he ‘swings’ his thumb under his forefinger and pulls the forefinger up and over the thumb that I began to hear something vaguely close to his sound. It seems more intuitive to use additional fingers to try and do this because they offer more “coverage” of the strings. To simply strum down with your thumb and pick up with your forefinger only works, at first, if you do them one after the other, like in a traditional Western strum. To demonstrate them separately was of no help for me. I needed to see the entire combined movement as a whole to start to feel and hear the beauty of it. It’s a highly nuanced style that when the rhythm changes becomes even more complex as that forefinger and thumb become far more than just a down strum and an up pick. Basically, “it ain’t as easy as it looks”, but that’s the beauty of it. Thank You Kimo!!! Hallelujah is such a great study of this style. The legend provided for Ipanema is absolutely critical for understanding the tab format in Hallelujah. I worked on Hallelujah diligently for a couple hours every night for a week. It is important to get every left hand motion and right hand rhythm changes down as noted. There are a variety of right hand rhythm movements there. I have decades of classical and flamenco style guitar playing under my belt and this did not come easy. The smooth execution of Hallelujah is finally just about complete, but what it has done for my ukulele playing is what is really great. 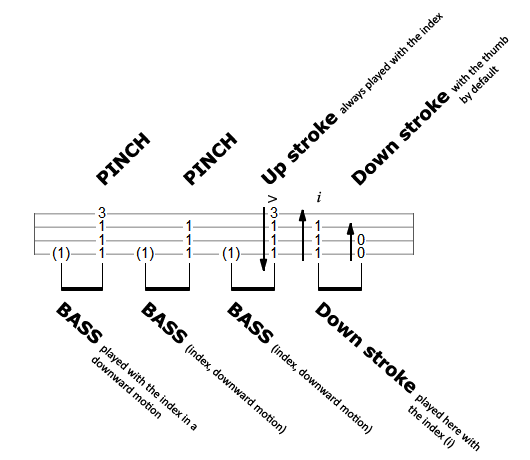 Being able to really control the brush of two strings during the “pinch” motion of the thumb and using the index both for both bass down stroke and a light upstroke seems to really train the ukulele hand. It has taken my basic triplet (t-i-i) pattern into a whole other world where I feel like I can improvise some scale patterns fluidly and lightly and it sounds good and clear. It also seems to have really improved the beautiful “flicking” execution of the index finger picking that you hear the great players doing on the some of the resource center videos here. You are awesome Kimo! The number of beautiful and accomplished players in videos on this site is inspiring, especially Cory. Very inspiring! I’m new to the uke and I’m finding myself gravitating toward Kimo’s style. It calms my soul. He seems like such a humble and passionate person. Thank you. Love the web site and all the help! I’m on my 4th Ukulele….Still looking for a transcription of Kimo’s “today” by Bertrand! I have been working on it from the YouTube site for 2 years, but still need help. The version of Hallelujah is wonderful and I have fun playing it. I love my Kanile’a K1TP from HMS! this song always makes me cry,and I have looking someone to play this song for long long time.now, I found it,thank you ,Kimo.My feedback is please keep playing good music!I love this web site,helped me a lot.I found lot’s of answer here ! Thank you so much for these videos. I have only been playing ukulele a few months. It always felt natural for me just using my thumb and index finger. But most books say this is wrong. So you can imagine how thrilled I am to have discovered Kimo today. What I would like to know is can I play these same techniques on standard c tuned ukulele. Also when you play Kimo can you just say what size ukulele you are using and the tuning . ie. c, low g etc. As I say I only just discovered you today so you may always play same size and same tuning. If so I apologise for my ignorance. I have learned more in a few hours listening to you teach than all other utube blogs and books I have seen in past few months. I’m 63 and new to the ukulele, but already i love it. I wish you well and many thanks.